When I wrote about Berlusconi and the influence of Uranus-Pluto Transit on his horoscope, I was astonished to discover that he was born with Sun in Libra and Moon in Pisces. The Libra Sun with the Pisces Moon suggests a sensitive and delicate personality. When we think of Moon in Pisces we think of sensibility, compassion and creativity. The egoistic features, that come across through the medial representation of Berlusconi's behavior and statements, is usually not associated with this combination. So what is it that modifies this Sun - Moon combination so much to convey the image of an egoist, trickster and unscrupulous person? What we see first is the retrograde Saturn that makes a conjunction with the Moon. This astrological picture suggests the habitual control and suppression of feelings, an emotional pattern that is obviously strongly related to early home dynamics. Saturn symbolizes limits and controls, and here it correlates to personal boundaries and self-protection. In order to create emotional security, the Pisces Moon employes the sensibility within emotional tactics and hidden maneuvers. In this picture the innermost sensitiveness and needs feel endangered by parental controls and expectations. The self-protection need becomes very strong. That is why the Moon in conjunction with the Saturn can suggest egoism and selfishness - it is the self protective pattern of behavior that goes to extreme. Another point worth mentioning, although not directly related to the theme, is the midpoint of Venus and Mars that is positioned on the Aries Point. 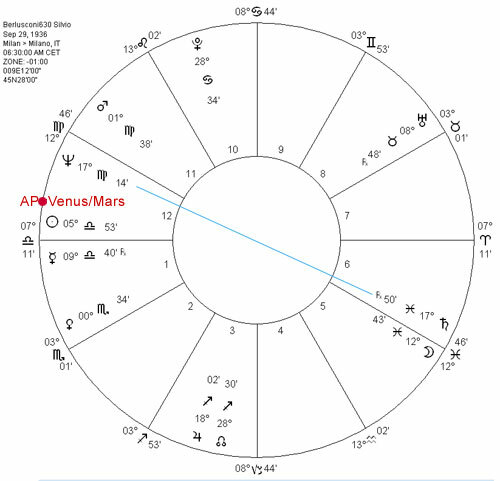 This suggests that Berlusconi has a need to project outwards his love life or love potency and to stage beautiful women as a part of his personality - Venus is the ruler of the Ascendant and Mars rules the 7th house.